Week #5: The final week is upon us! A botanical "sport" (aka "bud sport," or–outdated–"lusus") is "an individual exhibiting a sudden deviation from type beyond the normal limits of individual variation, usually as a result of mutation especially of somatic tissue" (Merriam-Webster). In other words, a sport is a portion of an individual plant that looks visibly different from the rest of that same plant. Compared to the original parent, sports can express remarkably different leaf color, leaf shape, branch structure, fruit color, and flower appearance. In many cases, farmers & horticulturalists have noticed sports that A) have an attractive new appearance or function and B) retain most of the traits that were desirable in the original. Thankfully, sports can be clonally propagated (by cutting, grafting, or budding). What would the world be like without sports? Consider just a few of the many sports that have breathed new life into our crops: Pink Lemons (yes, what pink lemonade comes from), Red Anjou Pears, Blood Oranges, White Peaches, Flat Peaches, ALL Nectarines (sports of peaches), most commercial varieties of Azaleas, Double-Flower Roses, Russet Burbank potatoes (the go-to variety for commercial french fries), and Seedless Navel Oranges. If all that doesn't make you a sports fan, I don't know what will! Thank you all for joining us this season! It has flown by. We hope that you've had a little time learn about apples & a lot of time to taste the apples, and that you aren't totally appled-out. Enjoy the fruit while it lasts! Just as the brilliant fall colors were blown from the trees in the storms this past weekend, we have given you a new rainbow of colors to dazzle your eyes. Purple, green, yellow, red and gold – what other fruit wears so many coats of paint? Happily for us, the beauty is not just skin deep, as these are some of the tastiest apples of the season. And the longer you wait to bite in, the better they get. The best apple for fresh eating in the bunch is the diminutive Golden Russet. We can’t get enough of them. Russets are the bane of the apple identifier since there are lots of them out there, and for centuries people have just called them “Russets”. This one is likely Golden Russet of Western NY, but we don’t really know. The lack of an accurate name should not affect the taste! Another confusing group of apples is the Greenings. We picked trees labeled as Rhode Island Greenings in two different orchards, but John had determined that one is actually Northwestern Greening. This is a common mistake since they look very similar. We mixed them together and labeled the bags only “Greening”. They are both good keepers, and their tart flesh makes them good for baking. We are on a roll this week with confusing variety names. 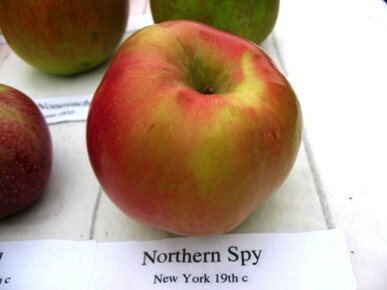 The apples inside the bags labeled Northern Spy are technically Red Spy, a Northern Spy sport. This bud mutation was discovered in 1938 in Michigan and has been propagated ever since for it’s rosy red skin color. In every other respect it is similar to the original Spy - great for pies and crisps, an excellent keeper and delicious fresh eating. Happily, there is no confusing the last three varieties in your share. Although Winter Banana and Yellow Bellflower have similar coloring, the waxy skin of the Winter Banana is a giveaway. And while we have seen other deep purple apples incorrectly marketed as Black Oxford (what apple wouldn’t want to claim that title? ), the ones in your share are the real McCoy. Like most of the rest of the apples this week, Black Oxfords have earned their reputation as a superb cooking apple. Try to hold onto them until the snow blankets the ground around your house. As they say, “good things come to those who wait”. For the final CSA installment of the year, we like to repost our winter storage tips, both to inform newcomers and as a refresher for returning members. We recognize that everyone's storage capabilities are different, therefore we try to cover all the bases (refrigerator, root cellar, etc.) so that you are equipped to get the longest life out of your apples. If you follow the guidelines laid out below, you could be eating and/or cooking with apples well into Winter and—depending on the variety—early Spring. The optimal storage conditions for apples are: 30-40°F, and 80-95% relative humidity (RH). Within that range, colder and more humid is the best (30-32°F, and 90-95% relative humidity). In many cases, it will be hard to sync both temperature and humidity. If you can keep the fruit near 32°F, you can get away with a little less humidity (80-85% RH). On the other hand, if you can only get the storage temperature down to 40-50°F, then make sure to raise the relative humidity to 90-95%. Some people run humidifiers in their storage space, while others simply mist the fruit periodically through the winter. Due to the high sugar content of apples, they will freeze at a lower temperature than water. The “freezing point” of apples ranges from 27.8°F to 29.4°F. If apples do get frozen, their quality will quickly deteriorate—the flesh will soften and rot will ensue. As a general rule of thumb, apples held at 40°F will age and decay twice as quickly as those held at 30°F. Apples held at 50°F will age twice as fast as those held at 40°F. At 70°F, the speed of deterioration doubles again. Whatever storage facilities you have available, try to keep the temperature consistent. Large temperature swings will cause more respiration and thus faster decay. If you are storing your apples in a refrigerator, be sure to keep the apples in perforated plastic bags. The plastic will help retain moisture (refrigerators are drying agents), and the perforations will allow carbon dioxide to escape. In the absence of perforated bags, you can use unperforated polyethylene bags, but do not tie them shut—once the fruit is cooled in the refrigerator, simply fold over the open ends. Be sure that your refrigerator isn't set too cold; you don't want to store the fruit in the back of the fridge and forget about them, only to have them freeze and rot! Wherever you decide to store your apples, make sure you can access them on a regular basis, in order to: a) monitor how the apples are doing, make adjustments if necessary, cull any rotting fruit, and—most importantly—procure fruit to use! Perhaps you have heard the adage, “The best fertilizers are the footsteps of the farmer.” The same principle holds true for storing apples: the apples that keep the best are those that are monitored and cared for regularly. November 9; Noon: Lewiston, ME - Senior College at USM Lewiston-Auburn College, room 170. November Food for Thought Luncheon. Doors open at 11:30. Program is free and open to the public. Lunch is optional. Lewiston, ME. November 15; 6PM-8:30PM; Portland, ME - Maine Historical Society. The Land that Sustains Us: Stories from the Field: MFT & Maine Historical Society present a live storytelling night with Jan Goranson, John Bunker and Sarah Loftus with stories from the land. The yearlong exhibition, Maine Eats: The Food Revolution Starts Here, will be open and available for viewing. Light, local food will be served after the program. Portland, ME. This recipe came from Olwen Woodier’s Apple Cookbook. Olwen provides quite a bit of interesting information on heritage apples and their uses, but disappointingly most of her recipes call for modern varieties. This one called for a Granny Smith apple so I thought I would give it a try with another bright green apple, Rhode Island Greening. It was a perfect substitute. The chopped apple softened and at the same time held its own so that you knew it was there. The muffins were tasty right out of the oven, but the crunchiness of the cornmeal really revealed itself the next day when we split, buttered and grilled them. Preheat oven to 400 degrees F. Grease 12 large muffin cups. In a large bowl stir together the dry ingredients. In a small bowl beat the eggs. Mix in the milk, cider, oil and honey. Blend well. Make a well in the center of the dry ingredients, and pour in the liquids. Stir until barely combined. Add the apple to the batter, and gently mix in. The batter will be lumpy. Fill each muffin cup 2/3 full. Bake 15-20 minutes until the tops of the muffins are lightly brown and the center springs back when touched. Remove muffins from the pan immediately, and cool on a wire rack. Option: Olwen recommends adding ¾ cup grated cheddar cheese to the batter. I tried it and found that the cheese flavor was completely overpowered by the cinnamon and nutmeg. So if you want a more savory muffin, omit the spices, reduce the honey and stir in the cheese. I really wanted to take a picture of this salad to include in the newsletter, but I just couldn’t make it look as delicious as it was. Perhaps it was because I made it with red cabbage instead of green and Golden Russet apples instead of red ones. Mostly I am thinking that it was the egg on top that obscured the colorful salad underneath. Anyway, food should be made for eating, not photographing. I hope you enjoy it as much as we did. In a small bowl, whisk together the vinegar, olive oil and optional chili oil to taste. Set aside. Preheat grill (or grill pan) to high. Place cabbage quarters cut side down on the grill, and cook several minutes till they are charred and softened. Turn over, and cook on the other side till charred. Remove from heat, and slice into thin strips. Heat 2 TBS olive oil in a small pan over medium heat. Stir in the garlic and the breadcrumbs. Cook, stirring often, till golden. Season with salt, and remove from heat. Transfer the cabbage to a large bowl. Add the diced apple, and toss to coat with the dressing. You may not need it all. Add the breadcrumbs and the feta cheese, and salt to taste. Divide the salad between four plates. Melt the butter in a large skillet over medium heat. Crack the eggs into the pan, and cook until the whites are set but the yolks are runny. Top each salad with an egg, and serve immediately. For a bit of extra zip, add a squeeze of sriracha mayo over, under or around your salad. Aaaand that’s a wrap for the tenth year of Out on a Limb CSA. Thank you for joining us! We hope you have enjoyed tasting your way through Maine’s many apple offerings. We appreciate your support. If you'd like to sign up for next season, please be in touch in the spring. We will send out an email announcement when we begin accepting members, and we do offer a discount to returning members.